23.07.2011 - What will hopefully be a template for future similar events took place on Thursday 21 July when four junior teams from Cowley, Cumnor, MCS and Witney met at Cumnor Chess Club for a three round rapidplay tournament (15 minutes per player per game). A very enjoyable time was had by all - many thanks to Steve Bennett for making such an excellent venue available. When the dust settled after three rounds of hard-fought chess Cumnor deservedly emerged as decisive winners with 14 game points out of 18. Such was Cumnor’s dominance that no other team achieved 50% game points, with MCS second with 8½, Witney third with 7½ and Cowley fourth with 6. Click for full report, results and photos. 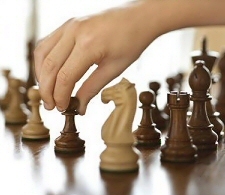 23.07.2011 - Joseph played the following game at the recent junior quadrangular team tournament at Cumnor Chess Club. I particularly liked the way in which he turned down the obvious recapture of a piece, taking a pawn instead for an irresistible attack on his opponent's king. P. McKenna (Cumnor) - J. Truran (Witney), Junior Quadrangular Team Tournament 21 July 2011. 18.07.2011 - Tonight's results: Marianne 1-0 Isabel & Isabel 1-0 Luke. Latest ladder here. 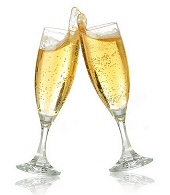 15.07.2011 - The last proper Club evening will be this Monday, July 18th, before we stop for our August break. On Monday 25th July at 7.30pm. we shall have an evening of sorting and checking all the chess kit we have. If you can come and help that would be great, and hopefully there will be time for a few games at the end. We shall start again on Monday Sept. 5th. Do keep practising as we have a busy season ahead. We shall have four league teams, one in each division, and hope to give even more youngsters a chance to play league chess. Do keep looking at the club web site. You will see how well our youngsters have done in the UK Chess Challenge Gigafinals. Thanks for everyone's support through the year. Cheers, Tim. 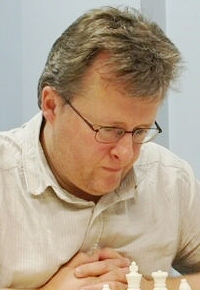 15.07.2011 - Peter Wells has won the 8th South Wales International with 7½/9 taking the first prize of £1000. The event was held at Penarth a town and seaside resort in the Vale of Glamorgan and involved over 70 players from 10 countries. Click for larger versions of these photos. 12.07.2011 - Witney Chess Club was well represented at last weekend's Southern Region Gigafinal at Reading with five juniors taking part - a great advertisement for the club and its junior players! My thanks to the parents for letting me have commentaries (Catriona, Charlie, David and Faith) and photos (Charlie). U10 section: Jenni and Jake both scored 3/6 and Marianne scored 4.5/6. Jenni and and Marianne were both happy - this was Jenni's first Gigafinal and she had some long battles, unluckily losing a couple of games on time but playing some good combinations. She also managed to record all her games, a first at a competition like this. Marianne beat her score from last year and beat one of the girls who had defeated her last week. She only lost to the girl who won overall. Jake managed a creditable 3/6, but he was disappointed with this final result as he was 3 wins up after 4 rounds. He did, however, beat the Kent Supremo! U12 section: Joseph scored 3.5/ 6. Apart from being "massacred" (his word) in one game he kept going and won his last game to get a rosette which he was very happy with and is now adorning his bedside table. He scored 2.5/3 with black, so it's probably time to work on some white openings as well! U13 section: Isabel had a tough first match against the ultimate winner but kept going for nearly the full hour. She finished with 3/6, which actually placed her third! So she's the first ever Witney player to qualify for the Terafinal. Congratulations to Isabel! 05.07.2011 - Marianne went to the National Girls Chess Championship on Saturday at St Paul's Girls School in Hammersmith. It was a tough competition, and after a first round win, she then played the 2 ultimate winners (both finished on 5.5/6) and lost both, although in at least one of those she felt equal to her opponent, and was cross at a mistake which cost her the match. In the afternoon saw a further loss, but she picked herself up, got on with the coaching with Harriet Hunt and finished the day with a further win and a draw. So, 2½ points in total and some hard-won experience. The advice from Harriet is to learn a few different openings - Catriona Hauer. 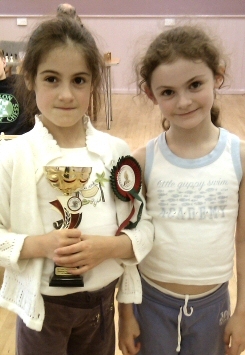 In June Marianne and Isabel took part in the Midlands Qualifier of the Girls National Chess Championship in Derby. Marianne won the U10 competition and Isabel was runner up (equal points with the winner but 2nd on progressive points) in the U14 section. Click to see a full report here. 04.07.2011 - The draft fixture list for the forthcoming 2011/2012 season has been published, and can be found here. 21.06.2011 - The 2011 Cowley Summer Blitz was held on Monday 13 June. A total of 44 players took part. An even more closely fought contest than in last December's Christmas Blitz resulted in a five-way tie for first place on 8 points out of 10, including three of the four players who tied for first place then. On the tie-break first prize went to David Zakarian of Cowley again. (a) Mark on coming second, equal on points with the winner. (b) Mercedes on being the best U10 prize-winner. (c) Dave on beating Mr Zakarian in one game and having him on toast in the other one. Cowley Chess Club thanks: Rose Hill Methodist Church for allowing us the use of the downstairs Hall for the event; the Kidlington Congress and Tom Williams for the loan of equipment; all who helped with the transport and setting up of equipment, especially John Taylor, Jon D'Souza-Eva, Will Burt, and Priscilla Morris, as well as the many people who helped with the clearing up afterwards; all those who kindly donated prizes; and of course all those who came along to play. 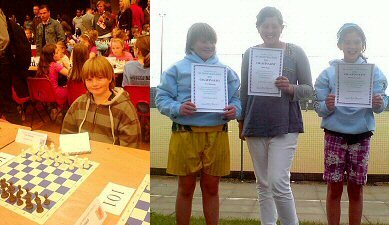 13.06.2011 - Marianne and Isabel took part in the Midlands Qualifier of the Girls National Chess Championship in Derby yesterday. The idea was to get some extra practice and competition experience - but to our surprise and delight Marianne won the U10 competition and Isabel was runner up (equal points with the winner but 2nd on progressive points) in the U14 section. The day was full-on chess with nearly every spare minute between rounds spent on coaching from IM Jovanka Houska, who was wonderful. However, the girls also thought they'd benefited from Dave Hackett's coaching over the last two weeks, so please pass on our thanks to him too! Some photos and games from the event are available here. We've now got the dilemma of whether to miss the Eynsham Carnival to take part in the final at St Paul's Girls School in London next month - Catriona Hauer. 09.06.2011 - The Village Hall will CLOSE at 12 noon on Sunday 31 July 2011 and RE-OPEN at 3.00pm on Monday 8 August 2011. This is due to decoration and maintenance and will apply to the MAIN HALL and the LILAC ROOM. Please contact me on 01993 709886 if there are any problems. Thanks, Sarah. 07.06.2011 - Monday evening's ladder results: Rich 1 Alan 0, Luke 1 Andy 0, Tim 1 Luke 0. The updated ladder can be found here. The 2011 Cowley Summer Blitz will be held on Monday 13 June at Cowley Chess Club (at Rose Hill Methodist Church in the Main Hall downstairs). All chessplayers are welcome. As usual, there will be ten games (five rounds playing games with both colours). A cash prize will be available for the tournament winner, and lots of other prizes of books, etc., including grading prizes, prizes for juniors in various age groups, for the best slow starter, etc. 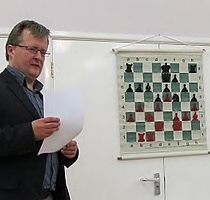 (For further details and for lists of prize-winners in recent blitzes, please go to the Cowley Blitz page (http://sites.google.com/site/cowleychessclub/cowley-blitz) on the Cowley Chess Club website). Donations of (non-alcoholic) prizes will also be gratefully received. Entry fee: £3, to be paid when you arrive on the night. Proceeds will go to the Lester Millin Memorial Fund. We will also be glad to receive donations for the Fund. Finally, if the entrant is a junior who can play in only the first two (or the first four) rounds, please specify which in your email. Advance registrations by email can be accepted until 12 noon on Monday 13 June. No Club Monday 30th May! 24.05.2011 - More club dinner photos have been added, including pictures of Tim and Mark and their trophies for chairman's award and best scorer respectively. Keith 1 Luke 0, Venetia 0 Jake 1, Tim 1 Joseph 1. Click for updated table. 23.05.2011 - Well known junior coach and organiser Andrew Martin has recently been pulling together some useful instructional material for juniors. Andrew's YouTube Chess Channel is here. I would be interested to hear from some of our juniors as to what they think of the videos. 19.05.2011 - OK ... I've turned Rich Weston's "hard copy" board into a spreadsheet so that we can keep both formats going over the summer months. If you can think of better nicknames for yourselves, let me know! If you can give this your support the club committee would be really grateful. The juniors in particular like it, and if it gives them the chance to play some "official" games against the adults over the summer so much the better. 17.05.2011 - Some ladder results from yesterday evening: Luke 1 Marianne 0, Andy 1 Jake 0, Gareth 1 Matt 0, Guy 0 Joseph 1. 16.05.2011 - Twins Mercedes and Venetia Hobkirk-Capps (8 yrs) started learning chess when 6 years old, but have non-chess playing parents, so had to learn everything from their chess club. Venetia has been diagnosed Asperger's Syndrome (a form of Autism), so concentration is a challenge but the organisers at Witney Chess Club have been extremely supportive. Venetia won the Gloucestershire 'Under 7 Suprema' Cup at the British Land Chess Challenge Megafinal in 2010, and also the 'Under 8 Suprema' Cup at the Gloucestershire Magafinal 2011 (Northern Gigafinal in Derby, July 2011). Both girls have numerous cups and medals from various tournaments, but jointly share the Silver Trophy, for the 'Smartest Girl 2011'. They also have individual trophies for 'Wiltshire and West of England Under 8 Best Girl 2011', but jointly share the Silver Cup for 'West of England Under 8 Girl Champion 2011' (with twins being in the same age group they often score the same points and are asked to 'play-off for the title/trophy but mercifully, sometimes they are allowed to share!). The girls play for Oxfordshire and hope to get an ECF grade this summer. Both thoroughly enjoy Monday evenings (7.15 - 9.00pm) at the Witney Chess Club, which is very welcoming to beginners of any age and the more experienced player. Pictured: Proud winners Venetia (left) and Mercedes. 16.05.2011 - Alan Gentry has kindly provided some pictures from the recent club annual dinner in May and some (belated) photos from the City 1 vs. Witney 1 match on 10th December last year (which finished in a 3-3 draw) are also available. See them and those of Mercedes and Venetia above on our club photo gallery. 10.05.2011 - Here's a nice article about Witney 1's Division 1 title that appeared recently in the Oxford Times. 10.05.2011 - After the unfortunate loss of the first chess ladder (dismantled by persons unknown), Rich has worked hard to recreate a new one (this time with a smaller board that can be locked away in the cupboard or taken home). Please support this new venture by (a) turning up at the club during the summer months to play ladder games (b) coming up with new nicknames if you think Rich hasn't been imaginative enough with his own creations. Recent ladder results of which I'm aware: Derek 1 Alan 0, Isabel 0 Joseph 1. Please let Rich and/or me have the results of ladder games as and when they are played so that the ladder can be kept updated. disposition - this video contains some swearing. 09.05.2011 - Our occasional junior reporter Luke Plowman tells us why he enjoys the chess club. Hopefully Rich has managed to reconstruct the missing ladder to avoid disappointment! I was interested by the way to read that juniors aren't always the technological masters of the universe I thought they were. Clearly Eddie Izzard isn't the only one to have problems. 'Here's another thing for the club website. Sorry that I haven't sent anything for ages but I was thinking what to do and then our CPU blew up but it turned out something wasn't plugged in. At WITNEY CHESS CLUB there’s a ladder and it’s really fun if you’re not trying to be competitive. The ladder is a big piece of cardboard with the names of all the players at and their nicknames in the order of how good they are. 08.05.2011 - ... and here are the promised photographs from 1992 and 1993. Omnia mutantur, nos et mutamur in illis. 08.05.2011 - Alec Toll and Derek Edwards have recently been burning the midnight oil unearthing some old club records from the early 1990s. The first instalment has been posted on the Archives page - a big newspaper article on Witney Chess Club's 1992/1993 league and cup successes in the Witney Gazette for 9th September 1993. Various annotated photos from the Frank Wood Shield finals of 1992 and 1993 and the various trophies won by the club at the time will be following shortly. Many thanks to Alec and Derek - and if anybody else can lay their hands on any historical material to do with the club I would be glad to receive it. 06.05.2011 - As well as Joseph's success at the Berkshire Region megafinal, Witney Chess Club juniors did very well at the Oxfordshire Region megafinal. Jenni (4/6), Jake (4/6) and Marianne (5/6) all qualified for the gigafinal in the U10 group, with Jenni coming third equal (and beating the girl she tied with) and Marianne second in the U10 girls. Isabel won the U13 girls Suprema title with 4/6 in the merged U13 section and also qualified for the gigafinal. Andy got 3/6 in the U12 section, a very creditable result in a tough competition but unfortunately just short of the qualifying mark. Our very own Alan Kennedy awarded the prizes. 03.05.2011 - 1) One of our juniors, Joseph Truran, qualified for the British Land UK Chess Challenge gigafinals over the bank holiday weekend when he scored 4½/6 to come second in the U12 section of the Berkshire Region megafinals. Did any of our other juniors take part in the megafinals, and if so how did they do? 2) At the final 4NCL weekend of the season Brown Jack (for whom Mike, Peter R. and Tim play) came third in Division 3 and so are promoted to Division 2 of the 4NCL next season. The report on the final weekend is available here. 08.04.2011 - Finally catching up after a hectic week and the final match report of the season. Witney 3 finished the season off in style against the bottom team Cowley 4. Luke finished very quickly such that I didn’t get to see much other than he was ahead on the brief looks I had ... continue reading. 07.04.2011 - The annual chess club dinner is scheduled for Saturday 7 May at Hacketts (7.30 for 8.00). I've negotiated a discounted price of £19.95 for three courses plus coffee. Spouses, partners etc., are very welcome as usual. Menu and further details are here. 06.04.2011 - First off, congratulations to all three Witney teams. We had a fantastic season, with two gold medals and a bronze (on goal difference). That sounds like a great result in anybody's book, and if there were an OCA award for best club of the season I think there would be only one candidate. Well done to one and all. By the way, I think it's somewhat counter-intuitive (to say the least) that a team with a game point difference of 16 should come third to a team with a game point difference of 2 (really? only 2??) and I shall raise the matter of tie breaks again at the next AGM. Anyway, to my promised match report. 06.04.2011 - Witney2 drew 3-3 with City2 last night in our final match of the season. This leaves us in third position in Division 2 on 17 pts, behind City2 in second place. Click here for Derek's detailed report and to see Howard's reply. 05.04.2011 - Witney 1 are Division 1 champions. Huzzah! Detailed report to follow. 04.04.2011 - I've recently had the privilege of spending some time with our longest serving club member Keith Broome and discussing the club's history. Keith is a mine of information on the early days of the club, but I'm hoping that there is more that we can recover - so if any of you have any memories that you would like captured for posterity. 03.04.2011 - In the end a comfortable win for the visitors, who needed to score 4 points to gain a match victory against the Witney second side – a result which somewhat flattered Oxford while masking some performances of merit by the hosts. Read Sean's match report in WORD or PDF. See a collection of photos from the match. Click here to play through all games. 25.03.2011 - As the 2010-11 season draws to a climax, the question of whether things would end with a bang or a whimper had been largely decided a few weeks earlier when City dropped a point against Cowley 2 – but a win tonight would still leave them with an outside chance of Witney tripping themselves up in their last match (v Cowley 1, April 3). Download Sean's annotated report and play through the games from the match here. Photos are here. 24.03.2011 - A thorough thrashing on Tuesday night away to Bicester1 - unfortunately we were on the receiving end! Bicester, as expected, put out a strong side ... continue reading. 15.03.2011 - Rick Weston has set up a club ladder competition to stave off boredom during the long months ahead when OCA league chess takes a back seat. Could I encourage you to take part in it please, as it will give many of us a much needed opportunity for more serious practice (as opposed to successions of five minute games!) when there are no league matches taking place. Rick has kindly produced a set of rules (which will no doubt be refined over the course of time) and these can be found at the club; if I can get a copy of the rules from Rick I will post them on the website as well. Rick has also created various nicknames for each of us (of varying quality, it has to be said), so if you want to ensure that your "nom de guerre" is as you would like it, please have a look at the ladder board and let Rick or me know if you can come up with something better. YOU are the heart and soul of club chess; the middle lane road-hog. Even when overtaken you won't move over. Now you know who you are I will come to the point of this first article....which is....how to deal with finishing last. I spent three seasons dreading finishing last and it finally happened. It was every bit as terrifying as my nightmares. I had to go to the toilet again. I can't remember if I was four pawns or a minor piece ahead; and I can't remember if I lost or got perpetuated. I can't remember if it lost us the match, the cup or the season (PTSD I guess). It doesn't matter. The important thing is I am still in the middle lane, and I am not moving over. Thanks for reading ... it has helped me a lot to 'come out' here. Look out for my next article about brilliant moves. 10.03.2011 - Witney 1 have a five-point lead in division 1 but City 1, with a game in hand, can still just catch them. City 1's January loss to University 1 looks like the decisive result. Barring vast numbers of defaults, Didcot 1 are relegated. Division 2 is tight. Witney 2's loss this week to MCS Blackbirds 1 means that Witney are level with Bicester 1 but have played a game more, with University 2 just a point behind. Bicester defaulted their match at Witney so the top two haven't yet played this season. It's tight at the bottom too, with MCS and Cumnor 1 holding a narrow advantage over Wantage 2 although Cumnor have the toughest run-in. In division 3 Cowley 3 have dropped just a single drawn match all season and a single match point from a possible six will make them champions. Bottom spot lies between Banbury 2 and draw specialists Cowley Workers (6 draws from 10 matches so far!). Banbury and the Workers still have to play one another so they can't both overtake Didcot 2 or Bicester 2, both of whom have superior head-to-head records against the bottom two. A win this week over Cowley 4 has ensured that Witney 3 win division 4. St Clare's and Cowley each won at one another's venues (but nowhere else) and look to have a private battle for last place. MCS Blackbirds 2 could still theoretically finish bottom, but a point against either St Clare's or Cowley 4 would kill that possibility. A big thanks to all the players this year who have all made this success possible and with two games to go. With Witney 1 nearing their title it's looking like an excellent year for Witney Chess Club. 09.03.2011 - Wantage 1 ½-5½ Witney 1. A comfortable win in the end, although to be fair the score was slightly flattering. Read Mike's Witney 1 board by board summary here. 08.03.2011 - Upwards of 30 people attended Peter Well’s lecture on (almost) the above topic, organised by Witney CC, and a pleasant and thought-provoking evening resulted – punctuated by lively discussion, tea at the interval and some post-match pub analysis in the Bell Inn. Click to read Sean Terry's lecture report. 07.03.2011 - An excellent night for Witney 3 as we rolled out a number of Juniors and they all played well ... [continue reading]. 02.03.2011 - Read Derek's latest match report about Witney 2's resounding 4½-1½ victory at Wantage 2 last night. 02.03.2011 - Witney 3 took another step closer to the title with a hard fought victory over City 5 on Monday. Click here to see Roger's report and here to see Patrick's game from the match. 27.02.2011 - Some photos taken at the recent Peter Wells evening are now available on our gallery. 27.02.2011 - Our roving reporter Sean Terry of Oxford City took a number of photos at the recent 4NCL weekend at Sunningdale in which the Oxford and Brown Jack teams played. Click to see them here. 21.02.2011 - The Oxford 2 and 3 teams were in action this weekend in Division 3 of the 4NCL together with Swindon-based Brown Jack, for whom Peter Richmond, Tim Headlong and Mike Truran from Witney Chess Club also play. Both Oxford 2 and Brown Jack are flying high and are in the frame for promotion to Division 2. Sean Terry of Oxford City Chess Club has been kind enough to send through most of the games from the various matches. Click to see the games. 15.02.2011 - Click to see the Witney 1 v Oxford Univ. 1 match report (played 14th Feb) and Witney 2 v Oxford City 3's match report (played 14th Feb). 11.02.2011 - Witney Chess Club was well represented at last weekend's Kidlington tournament. Scores: UNDER 180: Derek Edwards 2½/5, Alan Gentry 2½/5. Scores: UNDER 145: Rick Weston 3½/5, Tim Partridge 1½/5, Joseph Truran ½/3. 10.02.2011 - Click to see Peter Wells' recent game in the Witney 1 v Cowley 2 match played on 7th Feb 2011. 10.02.2011 - The Witney 1 v Cowley 2 match report (played 7th Feb) is here & Witney 3 v MCS/B2's match report (also 7th Feb) is here. 03.02.2011 - Match reports for Witney 1, 2, 3 and the Frank Wood Shield can now be found on their own pages of the site. In the near future the games page will be similarly divided. This is to make access to the information easier and reduce the length of the homepage. 21.01.2011 - Click to see a report and pictures from Dave Hackett about Peter Wells' simultaneous display at the club on 17th January. 20.01.2011 - Please see the attached from Gerard O'Reilly regarding the forthcoming Kidlington tournament Sat 5th & Sun 6th February. This is a really excellent tournament which it is well worth playing in. Hacketts To Go will, as last year, be providing the refreshments. 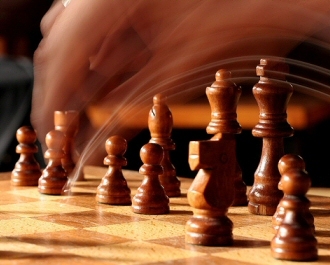 The 2011 Kidlington Chess Tournament is taking place on Saturday and Sunday 5th-6th February. There are 3 sections (Under-145, Under-180, Under-225) of five rounds each. The prize fund is excellent as always (over £1700), with a bookstall from Chess Direct, and refreshments available. Entry fee £25. Entry forms should be available at local chess clubs, or can be obtained direct from me. They can also be downloaded from the Congress website, http://home.btconnect.com/OCA/kid.htm where you will also find further details of the event. Please enter in advance if you possibly can (it helps us to make a prompt start to the first round). However, we will we not turn away players who turn up early on the Saturday morning to enter. We look forward to seeing many of you there for an enjoyable weekend's chess! 20.01.2011 - Mark Hannon got the only other draw to be achieved in the Peter Wells apart from Gareth's. Here it is. 19.01.2011 - Gareth Stevens from Cumnor Chess Club has submitted his excellent draw from Peter Wells' recent simultaneous display - one of only two players to prevent a clean sweep by Peter. Congratulations Gareth! We now have an online gallery. Click to see photos from the recent Witney 1-City 1 Frank Wood Shield match and from our match against City 1 in December. Mark annotates his game against Wei Sin Tan from the recent Frank Wood Shield match. Sean has kindly provided a PGN of games from the above match on 13th Jan (see below right). 06.01.2011 - Our games from the match Oxford City 1 vs. Witney 1 on 6th December are now available to play through here. 06.01.2011 - We recently received the following email from OCA League Secretary George Spalding in connection with a dispute a couple of years ago (which some of you may remember) in which the Wantage player failed in an attempt to claim a draw after the end of the game on the grounds that the Witney player had insufficient winning material (K+R vs K+R). What he should have done was make a claim under the OCA's version of article 10.2 of the FIDE laws of chess ("the two minute rule"). You may have noticed that International Arbiter Alex McFarlane is now writing a column in the BCM Magazine, answering readers problems. Just out of curiosity I sent him the details of the Wantage-Witney dispute of a couple of years back.You will not perhaps be surprised by the fact that his judgement was the same as that made by the OCA Committee - a win for White (the Witney player). But it is good to know that the right decision was made by us based on the facts. See page 33 of the January 2011 issue ( Vol 131, No 1) for details. The moral as always is - claim BEFORE your flag falls! The wording of article 10.2 is below. I strongly recommend that if you have a moment you look at the OCA's interpretation of article 10.2 in the Guidance for Captains document on the OCA website www.oca.oxfordfusion.com/GetDocuments.cfm. It might happen to you! 10.1 A 'quickplay finish' is the phase of a game when all the (remaining) moves must be made in a limited time. 10.2 If the player, having the move, has less than two minutes left on his clock, he may claim a draw before his flag falls. My thanks to Matt for selecting my loss for publication! 16.12.2010 - As most of you will hopefully know, we will be holding two more evenings with Peter Wells in the new Year on 17 January and 21 February. The flyer gives more information, and I very much hope that as many of you as possible will be able to attend. Please note the 31 December date for discounted entry fees - I will be at the club on Monday 20 December should anyone wish to sign up then. These evenings are open to all Oxfordshire players, and we are very much hoping that, as with last season's sessions, they will be well attended such that further such evenings can be arranged in the future. 1. Both evenings booked by 31 December: £10.00. 2. Individual evenings booked before 31 December: £6.00. 3. Bookings after 31 December and on the night: £7.50 per evening. Light refreshments (coffee, tea etc) will be included in the price. If you would like to attend, please make cheques payable to "Witney Chess Club" and send them to me at The Old Farmhouse, 7 Church Street, Ducklington, Witney, Oxon OX29 7UA. For the first evening (simultaneous display) Peter has asked that numbers be limited to 30, and so we will need to accept bookings for this evening on a first come first served basis. For the second evening (modern opening preparation) we will be able to accommodate greater numbers in our spacious new venue! We would be very grateful if you could publicise these evenings within your various chess clubs - as well, of course, as attending yourselves! 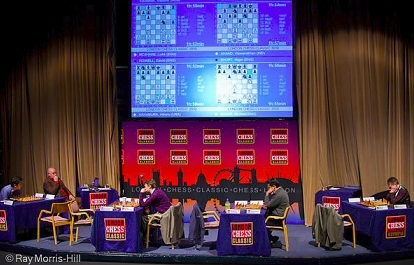 08.12.2010 - Anyone interested in watching chess at the very highest level (yes, even higher than Witney 1) could do a lot worse than to attend the London Chess Classic at London Olympia. I went up on the first day (Wednesday) and found it utterly absorbing. 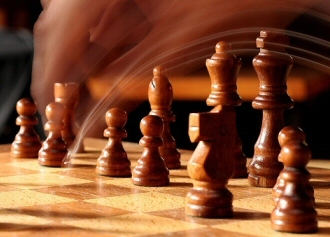 The 2010 London Chess Classic is the strongest event ever to be held in Britain with eight of the world's best players. Among them are world champion Viswanathan Anand, from India (current rating 2804), 20-year-old sensation Magnus Carlsen, from Norway (2802) and former world champion Vladimir Kramnik (2791). The facilities for spectators are excellent, with a giant screen showing each day's four matches, which take place simultaneously, above them in the main auditorium of the Olympia Conference Centre. In a separate room, there is detailed analysis of each game by grandmasters and international masters, in which the audience are more than welcome to chip in with their own suggestions. The day I was there GM Daniel King, IM Lawrence Trent were doing the analysis - again very clear for the audience on a giant screen - with GM John Nunn chipping in. I witnessed an exciting win by Michael Adams (Eng) against David Howell (Eng), and a surprise win from Luke McShane against Carlsen, the Norwegian getting himself into all sorts of problems on the back rank. Entry costs £10 and there is much to see, in addition to the main matches, with numerous other events, a simultaneous involving Viktor Korchnoi, and of course hundreds upon hundreds of chess books and other memorabilia for perusal and on sale. The event lasts until December 15th and I highly recommend it, for anyone with an interest in the game. It is fascinating to see the world's best players in the flesh (Kramnik has such an air of authority about him) and I'm already planning to go back again one day next week. 06.12.2010 - Huzzah! We made a surplus of £3.68 towards club funds! More importantly, quizmaster Alan Kennedy ensured that the evening went with a swing, although the lack of sports questions and general knowledge questions hampered the style of some of us (Dave Hackett and me respectively) - or are we just being bad losers? My team was, however, able to boast a clean sweep on naming all the streets on a Monopoly board thanks to Jules Kennedy. A sign of a mis-spent youth methinks. Faith Truran arranged an ample supply of drinks (wine, soft drinks) and nibbles, with a few wine bottles left over which served as prizes for the winning team (Mark Hannon, Ian Meyrick and Faith). Fifteen courageous souls braved the cold to attend - many thanks to you all for your support. 05.12.2010 - The 2010 Cowley Christmas Blitz will be held on Monday 13 December at Cowley Chess Club (at Rose Hill Methodist Church in the Main Hall downstairs). All chess players are welcome. As usual, there will be ten games (five rounds playing games with both colours). The tournament winner may take either a cash prize or one of the donated prizes from the table, and there will be lots of other donated prizes of books, etc., including grading prizes, prizes for juniors in various age groups, for the best slow starter, etc. Further donations of (non-alcoholic) prizes will be gratefully received on the night. Advance registrations by email can be accepted until 12 noon on Monday 13 December. 03.12.2010 - Former club member Alec Toll has sent us this 'Remarkable Coincidence' report from the wilds of Norfolk. Enjoy!" 02.12.2010 - Just a reminder about the forthcoming quiz evening on Saturday evening 4 December. The plan is to start at around 7.30 pm with some drinks and nibbles, with Alan Kennedy then leading us into a gentle set of general knowledge quiz questions to exercise the little grey cells and closing with some more drinks. There'll be a small charge of £5 per person to cover room hire and a modest contribution to club funds. Drinks and nibbles will be free (the village hall licence doesn't allow us to charge for alcoholic beverages). We very much hope that you can attend - it should be a convivial and sociable evening, and you can all laugh at me when I get grumpy because I don't win. Please bring spouses, partners, children etc along - the more the merrier. We promise no chess questions. If you could give me an idea before hand as to whether you can attend that would be really helpful in terms of planning the catering arrangements. We look forward to seeing you there! Members from other clubs are of course very welcome.